This year’s Premier League has provided an exceptional brand of entertainment at the top of the table. This is partly due to the fact that for the first time in a long while, there is a genuine top six; all of which have at least some legitimate intentions to win the title. That there is no obvious stand out team at this point – Manchester City fans may argue this point – also contributes. The main reason, however, is just the sheer amount of goals, particularly in games between the big teams. 8-2, 1-6, 3-5, 3-1: fantastic games filled with bucket loads of goals. A number of us may pontificate on the merits of watching a tactically astute nil-nil draw but at the base level, games that have produced enjoyment are inextricably linked with the number of goals scored. Matches between the top clubs this season seem to have led to one engrossing classic after another. For me, this can be put down to a substantial extent to the culmination of a strategy led by Roman Abramovich. Eight and a half years have passed since Roman Abramovich quietly purchased Chelsea from Ken Bates for £140 million pounds. Three Championships have followed since but the full effect that Abramovich has had on English football is finally being felt this season. The Russian billionaire has given very short shrift to managers. Jose Mourinho brought unprecedented success to Stamford Bridge. He wrapped up two titles in convincing style and looked like forming the beginnings of a dynasty. This did not seem to be enough for Abramovich though. Amongst a whole host of other problems (outlined in an article here) Abramovich tired of watching his team grind out victories, with Mourinho using his favoured defensive 4-3-3/4-5-1 formation. Mourinho was asked to leave, starting a trend of managers being given very little leeway. This is wholly understandable though. 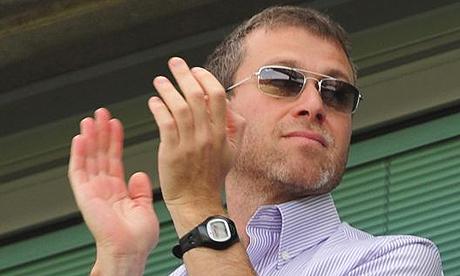 Abramovich has bought the club for a lot of money and has invested a lot since. Does this not give him a right to demand a certain style from his club and manager? Why would you want to pay all that money to buy football that you do not enjoy watching? When you buy a toy, you buy one with bells and whistles, not one that is gruellingly efficient. The expensive arrival of Villas-Boas and his immediate insistence of a playing style packed with attacking threat and flair is testament to this. For Abramovich, using his millions to secure exciting, aesthetic football seems to have become more of a priority. Now that Manchester City are also the plaything of a billionaire, I believe we are seeing the same thing there. Perhaps success is most important for them at present, as it was for Abramovich at the start, but we have seen a marked change in manner that they are playing this year too. Possibly this is down to the entrance of more potent offensive options and the settling of a core group of players but I also think it is likely that the owners are having a similar influence to that of Abramovich in demanding more stylish football, sometimes to the detriment of their defensive play. The billionaires have a lot to answer for in how English football has developed, very little of it good. For me though, their influence is helping create one of the best seasons, that certainly I remember watching.